Our Turkish pistachios deliver the very essence of pistachio goodness. The kind of gifts that anyone on your list would be overjoyed to receive. Why Shop WithSuperior Nut Store? 100% Free Shippingto the lower 48 states On orders of $500 and up. Twice the size of regular cashews, so you get double the joy in every bite. If you love nuts, truly love nuts, from Chocolate Covered Almonds to Honey Roasted Peanuts to Colossal California Pistachios, you're in the right place. Superior Nut Company is the best place on the web to find high quality, premium dried fruits, gourmet nuts, nut butters, and gourmet gift baskets for all occasions. Doing what we love since 1929, we still roast our specialty nuts the old fashioned way, in small batches at our plant in Cambridge, Massachusetts. 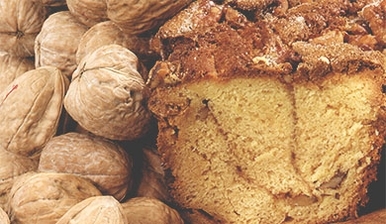 Decadent nuts and dried fruits are our business. It's easy to indulge but difficult to decide between delicious Giant Whole Cashews, Superior Mixed Nuts, Australian Glazed Apricots, or Pecan Caramel Chocolate Turtles. Try them all. Don't forget our Peanut Butter Ice Cream Topping. It's the perfect addition to sundaes or smoothies. 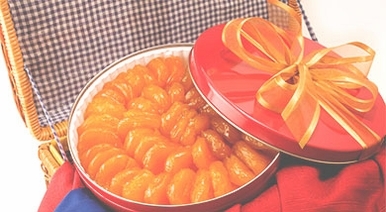 Superior Nut Company offers a wide variety of beautiful Nut Gift Tins, Nut Gift Boxes, Nut Gift Towers and Nut Gift Baskets a delicious treat that's good for all occasions. If you need to say thank you or congratulations then the best nut gift baskets, corporate gift baskets or gourmet gift baskets are only a click or phone call away. Want more heart smart choices? No worries. We have an abundance of healthy options, including organic nuts, and delightful dried fruits with low or no sugar added. Indulge in Pumpkin Seeds and Sunflower Seeds. They're packed full of antioxidants, fiber, essential fatty acids. Don't miss our Dried Mangos (with Less Sugar Added), Dried Turkish Apricots, Premium Australian Ginger Slices, or dried Goji Berries. 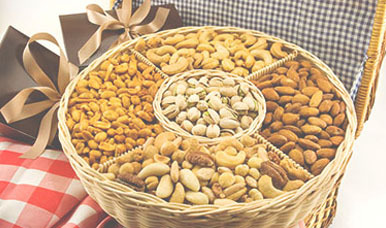 Looking for gourmet nuts wholesale and gourmet nuts in bulk? No problem. We can accommodate large and wholesale orders. The smooth, buttery flavor, the satisfying crunch, the delectable saltiness - this is the flavor expected for the specialty gourmet nuts from the Superior Nut Company. Since 1929, the Superior Nut Company has been the Massachusetts purveyor of fine roasted gourmet nuts, chocolate covered nuts and dried fruits. We have since moved the roasting facility from our basement to a factory in Cambridge, but our process is the same: we roast our gourmet nuts in small batches, the old fashioned way. In addition to an array of classic roasted gourmet nuts, we also offer premium dried fruits, chocolate covered varieties of both nuts and fruits, nut butters, candies and gourmet gift baskets. It's easy to indulge, but difficult to decide among delectable Giant Cashews, sweet Australian Glazed Apricots or decadent Pecan Caramel Chocolate Turtles, but when you order your favorite gourmet nuts from Superior Nut Company, you don't have to. Order one of our gift baskets for a variety of your favorite flavors, all hand-selected by you. Don't forget our peanut butter ice cream topping - it's the perfect addition to sundaes or smoothies! Want a scrumptious snack without sacrificing your health? Nuts and dried fruits are packed with an abundance of nutrients, anti-oxidants, fiber and heart-healthy essential fatty acids. Why Choose the Superior Nut Company? 1. Our commitment to customer satisfaction and a quality product is evidenced by our 100% Satisfaction Guarantee. 2. Most orders ship the same day for optimal freshness. 3. Read our testimonials - we have thousands of happy customers who have awarded us the Yahoo! Top Service 5-Star Award. 4. Our products are the healthier choice for snacking. 5. Your privacy is always protected, and your shopping information is kept safe and secure. No questions asked. 6. With over 80 years of experience, you can be sure that you and your gift recipients will receive the freshest and most delicious gourmet nuts, dried fruits and chocolates in the business.